Etihad Airways is rolling out Adobe’s marketing, creative and document management solutions in order to lift the group’s digital guest experiences and capabilities to new heights. The new partnership reflects a $25 million investment into improving guest services, and is just one element of a transformative technology strategy that stretches across the group’s customer, digital, analytics and operational activities. Under the new agreement, Adobe’s Marketing Cloud, Creative Cloud and Document Cloud will be deployed across guest experiences and used to deliver self-service capabilities across digital devices. The platforms will then be used to fuel marketing, global loyalty, cargo, direct sales, social media and digital signage capabilities. As well as the core Etihad business, the deal extends to the group’s partners airlines: Air Berlin, Air Serbia, Alitalia, Jet Airways, Air Seychelles and Etihad Regional. In an exclusive Australian interview with CMO, Etihad’s chief information and technology officer, Robert Webb, said investing in digital was vital to the future of the organisation. “The airline industry is very competitive, and inventing in great digital experiences is the last bastion of competition,” he said. The Adobe platform will enhance the airline’s ability to create tailored, self-service offerings for guests, he said. Etihad investigated a range of products in market before deciding on Adobe as its platform of choice. Webb highlighted the vendor’s efforts in recent years to unite several acquisitions and organic developments into a highly integrated suite of marketing offerings, as well as its analytics capabilities, as key selling points. Taking a cloud-based platform approach was also vital for rapid innovation, scalability and future growth, he said. “This was an opportunity to get an enterprise-wide agreement to embrace the full suite and integrated offering,” Webb said. While the overall deal is being managed by the CITO function, Webb said partnership between the CIO, chief commercial officer and CMO functions was vital to its success. To achieve this, the group spent time creating a shared vision, listening to the voices of its equity partners to ensure everyone understood the logic behind the cross-company collaboration and technology investment, he said. Etihad’s technology and marketing functions have also partnered on an enterprise digital guest experience council to share best practices and engage all teams to use the Adobe clouds together. “We are driving together as one business and really focused on delivering business value through this technology,” Webb said. “It’s not technology for technology’s sake, it’s about how to help grow the business and better serve our guests through online channels, ancillary services, as well as better services in times of disruptions, for instance. In addition, Etihad has created centres of excellence to ensure economies of scale and skill, and is working with Adobe now to train 50 employees globally as technology super users. Staff are from the marketing, commercial, ecommerce and technology departments. Economies of scale were another important factor, and Webb noted no individual airline in Etihad’s group could do this kind of digital transformation on its own. “This was an entire company agreement for change – we’re better together for technology purchasing, people and skillset development,” he said. Webb said Etihad is investing over $25 million into its guest experiences alone in order to compete in the digital age. “This is just the first step in our investment with Adobe, and there are other investments above and well beyond that,” he said. “In terms of digital experience, we will invest more and more rapidly as this area of need to compete with creatively and analytics. Etihad is first bringing on Adobe’s SiteCatalyst marketing analytics and reporting platform, and the Creative Cloud, across the whole group, then will move to full implementation of the Document Cloud. It is using a total of seven of the eight offerings under the Marketing Cloud (excluding Primetime). Prior to the new deal, specific Adobe products were used across the airline group, mostly in creative development. The investment into Adobe’s platforms is just one of many technology partnerships inked by Etihad this year. Earlier this month, the airline signed a $700 million, 10-year deal with IBM to cover its operations, security, mobile and analytics technology needs, a deal that encompasses customer and predictive analytics and a new data centre. This followed another multi-million dollar agreement with BT and Cisco to virtualise its contact centres. Webb said the partnership with Adobe was one component of Etihad’s wide-sweeping 2020 technology and innovation growth plan. Adobe president for Asia-Pacific, Paul Robson, said the Etihad deal was a very significant one for the software vendor and not only represented an investment from the airline’s point of view, but also Adobe’s in terms of training and skillset development. “This is an example of how we want to partner with customers through the full set of capabilities, from content creation, data and analysis, to create an audience profile of one, then CMO to provide personalised content experiences across multiple channels,” he said. “We’re excited about partnering with an organisation that wants to deliver digital experiences that are as strong, or as good as the inflight experiences. 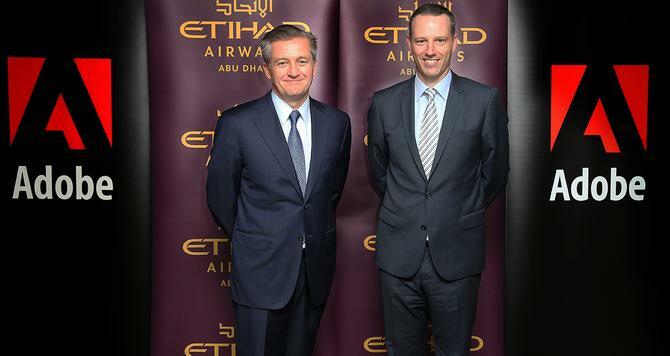 The first phase of work for Etihad is developing a digital guest experience of excellence. This will be followed by a systematic, step-by-step approach to upgrading the mobile experience, kiosks, then digital signage and mobile tracking at Abu Dhabi Airport. “We’ll follow best practice and share innovations across the group. For example, mobile development at Etihad would then be shared with Air Berlin,” Webb added.“I think it’s smart to have a more distributed centre of excellence, not just one physical location.